From brainstorming content to shooting photos to publishing & promoting on social media, there are so many moving parts in order to run a successful blog. Sometimes it feels like the whole world is spinning around you & nothing makes sense. Sometimes it feels like the trends & algorithms keep changing & you can't keep up. Sometimes it feels like everyone is improving & you haven't made any progress at all. If this sounds like you, keep reading. Sure, I quit my job in June to blog & coach full-time, but did you know I've been blogging for six years? It's true! Have I had failures? Um, yeah. I've been rejected hundreds of times. I've sent hundredssss of pitches to brands. A brand asked me to create content for them, then didn't accept my submission. I've spent a countless amount of hours writing, creating, content, promoting without any foreseeable progress. Have I had successes? Hell yeah! I recently hit 1 million total page views! I've gone on press trips. I've earned thousands of dollars from my blog. I began blogging + social media coaching as a direct result of reader interest. Now I'm figuring out other ways to expand my business & reach. But the thing is, any success I had took time, effort, consistency, & a million other moving parts. Any success came with a failure or two. If you're feeling frustrated with your blog, read this. It comes from the heart. It comes from someone who feels the same way sometimes. "Blah Blah Blogger only started two months ago & already makes $1,000 per month & has 50,000 followers on Instagram & gets thousands of daily blog views." Comparison is the thief of joy, my friend. You have no idea what's going on in their life or what they do to make it work. Maybe they're putting in 50 hours each week for their blog/social media channels. Maybe they hired a team of 8 staff members to help them take photos, edit graphics, & even write their posts. Each person is different, so different steps & actions are needed in order to receive results. It's up to you to put in the time, the effort, & the work needed to succeed, that applies to anything in life. It doesn't happen overnight. Chip away at blog tasks throughout the week, or bulk it all up in one day. Find a method that works for you. I worked full-time & I still blogged about 20 hours per week for about three, maybe four years. There was also a time where I was a full-time university student (30-40 hours) with a part-time job (15 hours) & part-time internship (15 hours), but I still blogged 15 hours per week (time-management is essential). Be patient & assess results regularly. Whether you're taking photos, editing captions, scheduling out content, responding to comments, you have to put in the hours over a period of time to build your blog & social media channels. "Will this trend work?" In order to make progress, you need results that work. In order to get results that work, you need to see what doesn't work. In order to see what does & doesn't work, you need to experiment, fail, get rejected. Test different methods, vary your publishing times, publish your post on different days of the week, experiment with photo filters, then see what resonates with you or your readers. Take a look at current trends, experiment, then find a way that works best for your brand. You can understand more about what works for you, your blog, your social media channels if you try it out & then look at your results. Have you ever worked so damn hard to achieve your goal that you failed to realize it wasn't your goal anymore? It happens more often than you'd think. Take a step back. Assess, evaluate, & reevaluate your goals on a regular basis. Is this goal still relevant? Is it the same goal I had a year ago or six months ago? Has this goal changed? If so, how so? What have I learned since I first wanted to achieve this goal? How can I clarify & reach my goal in the next year? What do I need to do? Evaluate your goals regularly. Google might help, maybe a peer or coworker or friend, but maybe you need one-on-one assistance, kind of like a tutor. Some people are so used to struggling, they never even thought to ask for help. Whether you're wondering "what do I want to do with my life? or "how can I monetize my blog?" or "what content should I be producing? ", it can be beneficial to chat with a coach who listens to you, believes in you, & helps you work toward your goals. 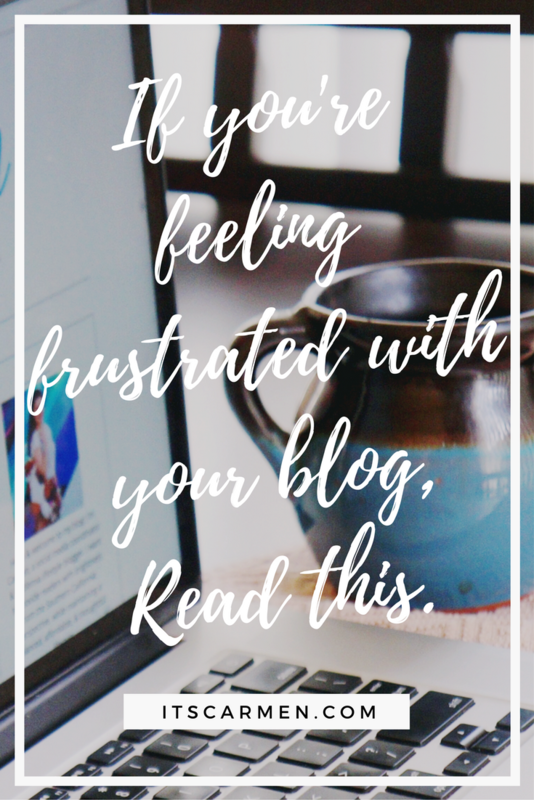 If you're feeling frustrated with your blog, please know that you're not alone. It's completely normal & it happens to me all the time, even though I do this professionally. So keep doing you & the rest will fall in place. Focus on your blog. Focus on building a community. Focus on authentic growth over a period of time. Sometimes it can feel like you're doing all you can and get nowhere! I think the most important tip is your very first - don't compare yourself! It's true, some people spend hours working while others still do it as a hobby. There's absolutely no way of knowing the behind the scenes! Thanks for the wonderful words of encouragement Carmen! This is a great post! Thanks for this! This is a breath of fresh air. But yeah, comparison is such a waste of time, don't do it! I've been blogging for 3 or so years, and I've come to the same conclusions. We live (or blog), we learn! Thanks for such a wonderful and encouraging post, Carmen! It can definitely be easy to play the comparison game or expect to compare yourself to others or expect immediate growth, but that's not always the best plan. I appreciate you putting things into perspective! What an inspiring post! Thanks, I really needed to read that today. You've been blogging for so long, that's awesome! It's true that when you put in the time it pays off! I have been blogging for three years and I have not only learned a ton, but am earning ten times more now than a couple of years ago. Love these tips. Sometimes people think successful bloggers make it big overnight - but it's really the long days, hard work and persistence over a LONG time that make it successful! I stopped comparing a while ago and I couldn't be happier. I am also doing what makes me happy and not what is trending. I am so much happier since I started doing that as well! oh man, in the beginning I compared myself SO. MUCH. to everyone, and it was not fun, always feeling like I had to do better. even now, every few months, it hits me. but it's getting way better, and the most important thing is that I like it, and I'm learning so much! Geeat post! Feeling frustrated lately! Love this post!! Very motivational. Thanks! wow, this is truly the post I needed to read today. I love what you said about comparison being the thief of joy I totally relate. I haven't been at my blog for very long, I am proud of how far it has come. Though if I compare it I become unsatisfied. Love the post ! I love this! such inspirational tips! This is truly refreshing to see. Struggles may be part of your passion but with sheer dedication I know you can rock 6 years more. Thank you for sharing this. This is such an amazing post! 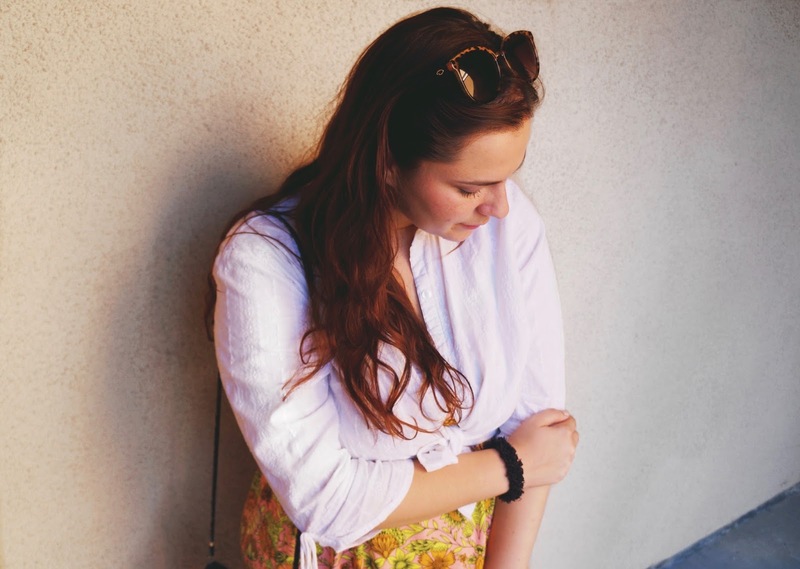 It's so easy to compare yourself to other bloggers and it happens more often than not. This is just what I needed to read today. My goals for my blog completely changed and I've definitely been struggling with that. It's been getting better though and whenever I work on a new post, I feel more motivated and excited. Thanks for sharing! 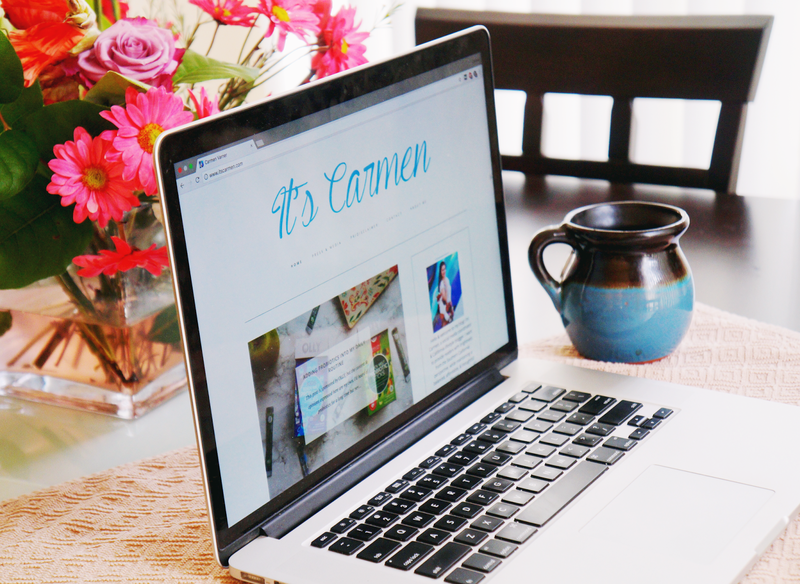 Thank you so much for writing this post, Carmen! It's uplifting to hear how you've been blogging for six years, and to see that you've experienced struggle as well. It's inspiring because it shows me that we've all been there, and that you can do great things if you keep at it. Your hard work has definitely paid off! I just returned from a 4 month hiatus on my blog. I wasn't really frustrated but unmotivated and lacked a clear vision. I'm back to blogging again and can agree that evaluating goals is an important step that can't be overlooked. Things can and WILL change! Really glad I read this post. It is really inevitable to compare other blogs to yours. Love the motivational read. Absolutely! At the end of the day we are all different people with such a range of experiences, locations, resources, etc. it would be so difficult to compare yourself! Comparison is one of my biggest struggles, so I wanted to highlight that! Thank you so much for reading! Definitely been a long time! Absolutely, & it's encouraging to learn as things change online & offline! Exactly Brittany! That's very true, sometimes people notice the blogger once they're big, but weren't there to see the time & effort it took to get there. That's so great Isabelle! Keep it up. That makes me happy. Thank you Katya!